MEGHNA Bank Ltd. Job Circular for the post of Management Trainee Officer. Recently MEGHNA Bank published a job circular to strengthen and enrich their workforce. It’s a great opportunity for bank job seekers. If you want to apply for the post please read the job details below. Bank / Company Name: MEGHNA Bank Ltd. Candidates should have MBA/ MBM/Masters degree with Honours in some selected department having minimum two first division/class having no third division/class. They are: Banking, Finance, Marketing, Economics, English, Accounting, Management, Computer Science, Statistics, Mathematics. 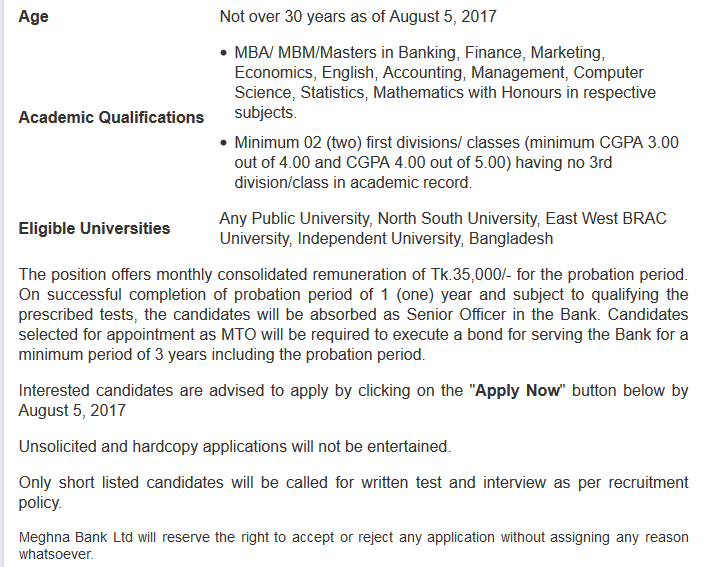 Eligible Universities: Only selected university mention below can apply for the post. Please check your university name below before application for the post. Age: Should Not over 30 years as of August 5, 2017. Salary: Monthly 35,000 Taka for the probation period and after successful completion of probation period candidates will be promoted as Senior Officer of the bank. Selected candidates for will be required to execute a bond of serving the bank for a minimum of three years including probation period. Only shortlisted candidates will be called for written and further examination as per company recruitment policy. The bank reserve the right to accept or reject any application without giving any reason. Interested and qualified candidates are requested to apply online by clicking Apply Now button below.